Power, power, who’s got the power? YOU DO after you read this book! It’s a tough but interesting world out there. 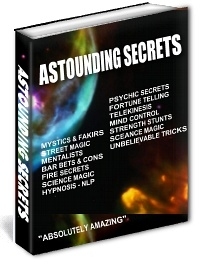 Learn the secrets of psychics, levitation, mind reading, con men, magicians and even some religious charlatans. All are tricks. All explained. Learn to do what others think is impossible. Amaze and astound your friends, co-workers, relatives even strangers. Want to challenge the strongest person in the room and beat them at their own game? Oh the possibilities . . . All this and more you will learn in just this one truly amazing book. I can not only promise you this, but I back it up with a full money back guarantee (like many of the bets, wagers and games in this book, you can’t lose!). So many ways to utilize this incredible knowledge. I once worked as a manufacturers rep. There was a store that almost never allowed displays. I spoke to the owner and told him I had heard that getting a display in his establishment was next to “impossible.” He agreed. I politely told him I specialized in “impossible.” When he asked what I meant, I told him I could do the “Black Hole” revealed in the Impossible Chapter. He laughed at me and told me if I could do that, he would allow the display. He actually laughed at me. 20 minutes later, I was putting the display up in the front of the store. I became a sort of legend amongst the other reps, and they all wanted to know how I did it. It even earned me a bonus! Make an “impossible bet” or two and not have to pay for another drink all night. Life of the party? You can OWN the party! Perform feats that will have everyone asking “How the hell did you do that?” Have them talking about you to their friends the next day. YOU CAN BE THAT PERSON. Enjoy the power of Astounding Secrets. Relish life. Be AMAZING! Imagine people's surprise when you challenge someone to balance a coin on the edge of a dollar bill, and then you proceed to show them! The party is a little slow. Liven things up by showing how a person can be "levitated" or lifted with just a few fingers! It borders on mind reading, yet it is a simple, proven, physical manifestation that can tell you when a person is lying, when they desire something and even when they are sexually interested in YOU! Become a Phrenologist (really!) read bumps on the head, whatever. Learn the techniques of what is known in the trade as a "cold reading." Amaze and stun everyone with your “psychic knowledge and abilities” and your “talent” for telling a person about their Past, Present and Future. Don’t abuse this please. I have actually had people break down and cry when giving a reading. One gentleman once offered me a nice sum of cash to pick his stock investments. Of course I refused. Remember, this is a trick. You can amaze people, but do NOT take advantage of them. Ever. But . . . You can still have a blast with these techniques. People will actually think that you have some sort of power, some psychic insight. And they will flock to be around you. Just don’t get carried away.
" (this is)The easiest way to meet women I've ever seen! It’s almost embarrassing when I start “reading palms” or “analyzing handwriting” [I always have them write their phone # : 0)], they practically fight to be next"
Challenge some big guy with this one. You'll learn how to tear an apple in half with your bare hands (try it, it's tougher than it sounds). You will do it easily (once you know how). You can actually drive a nail with the bottom of some bottles. Imagine their astonishment when you “pop” the bottom out of a soda or beer bottle using just your hand! Strength challenges where you can beat the strongest man in the room, no matter what your size (even if you are a woman). The biggest man won't be able to lift you once you learn this "secret pressure point." How to keep someone a prisoner in a chair with just one finger. They’ll look ridiculous trying to rise. Some guys just have no sense of humor. If you embarrass some big muscular fella with one or more of these stunts, he might be insecure enough to get angry and perhaps do something stupid. Choose your “victims” with care! Imagine this. You are at a party or gathering and . . .
You “wow” the crowd by bending keys and spoons with "your mind." You make a compass move just by concentrating on it? North becomes East just because you “will” it to be. Picture this: You are at someone’s house for a party or gathering. They ask you to bend some silverware for them with your “powers.” You not only proceed to do so, but you dump the silverware drawer on a counter and tell others to try it! Now imagine their surprise when they find some of their silverware “bending,” sometimes right before their eyes! Now you have made everyone else amazing! They love your for it! What if you were to have a seance and make a table "dance," sometimes clear across the room? People (especially women) freak out over this one. Some of them will become so frightened they may need consoling. Impress those around you with various mind reading and telepathic methods that will convince them of your "powers." What if? How would people react to you if you could seemingly move things with your "mind?" How the hell did you do that? What if you could spin a coin on a bar or table, any bar or table (almost) and control the way it lands!? Would they be impressed? You will learn the Secrets of Telepathic Drawing. Reproduce a drawing made by someone else by "reading their mind." How to "stop" your heart. Picture this; You ask for a volunteer or two. They each feel your pulse and begin tapping the rhythm with their other hand. Suddenly the tempo becomes irregular, the beats on each side of your body may even be different. The beats become sporadic and finally stop as you exhale and seemingly collapse. “There’s no pulse!” screams one of your volunteers. You suddenly jump up and grin at everyone. How the hell did you do that? How to lay on a bed of nails unharmed. It’s a simple principle of physics (not psychics). But if you don’t know the secret, it’s amazing. Fire Walking: Oh what fun! What a way to spend an afternoon eh? Dig a big pit and start a bonfire in it and then hours later you spread the coals around and go for a little stroll right down the middle of it. You are incredible aren’t you? How to seemingly block pain and do very weird things to the body. Such as pierce yourself with needles etc., with no pain. Ever see a martial artist or wonder boy slice a melon resting on a persons chest with a sword? Revealed! The secrets of Meditation and more! "I liked your idea about the spinning coin! My boyfriend now owes me 10 hours of slave labor! That alone was worth the price of this book.This is great!" Well, you are within minutes of finding out. Heads or Tails? You'll learn to call it with virtually 100% accuracy. Challenge your local hot-shot that thinks they are a gambler and watch them panic when you are right, time after time. Would you believe that you can drop a light bulb onto a concrete floor (from waist high!) and it won't break! How to make steel burn with an ordinary match. How to balance an egg upright. This can drive people nuts when they don't know how. They are a lot of people out there that think this can only be done on a solstice. By now, you are starting to think some of this stuff is pretty good eh? You haven’t seen anything yet. There is a LOT that we haven’t talked about. A lot more. Bar bets aren’t just for getting free drinks or attention from onlookers (believe it though, you will get LOTS of both), they can also be a nice source of “extra income” if played just right. Witness the following true story (I was on leave while in the army). During his rebellious youth, the author once accepted a bet. That I could be dropped into any city in the country without a dime and never miss a meal or sleep without a roof over my head. Four hours after being let off in downtown San Francisco without a penny, credit card etc, I had 400 bucks in my pocket and called the other person and asked if he were ready to concede the bet. I called him from a rather nice hotel while I was enjoying room service. He paid me the six pack of Dos Equis without a whimper. Here's how I did it. I panhandled and asked three people for quarters. The last one of them gave them to me. I then took the quarters and used them to get into a newspaper machine. I took out all of the papers and sold them on the street. Total including tips . . . $6.75. Not enough money to buy a decent meal unless . . .
Armed with this small fortune I found a bar with a pretty good afternoon crowd and a happy hour. I ordered one draft beer for $1.50 (the bartender left my five sitting on the bar), made three of the bets found on this site and won over $200.00 in a little less than an hour. I then went to two more bars and repeated the process making about $110.00 at one and over $160.00 at the other. Pure gold. Not bad for starting with absolutely nothing a few hours earlier. As a little bonus, while waiting for my friend to show up, I went down to the hotel lobby bar and won another quick $60.00 with one of the tricks found in the "Impossible" section. In each bar I drank for free after making a little wager with the bartender. And yes, for those of you that are wondering, I went back to that same newspaper machine and left exactly double what they would have made from selling those papers. Karma y’know. These days I only use this stuff for amusement or occasionally for free drinks at a bar, just to keep in shape. The Challenge: You will set a shot glass full of your “marks” favorite beverage on the bar or table right in front of them and they will not be able to drink it. You take the shot glass, do this and set it in front of them. They blink, look at you and say something like “Oh #$%&^ and then play with it a little before they pay you off. You did it again! You win! (This little jewel is one of my favorites, you can do it anywhere without any preparation). The Challenge: You can can drink three (or four or five) glasses of beer before they can drink one tiny little shot of their favorite beverage. You do what we reveal and then leisurely drink your beers while they freak out. You win again. Imagine that. The Challenge: You can make a coin land on the side of your choice 7 out of ten times (The odds are 50/50 right?) Wrong. Not for you my friend, you are now a winner. If they don’t take the bet offer to do it 8 out of ten times. If you have to, bet 9 out of 10 (but always start out lower, adds drama and gives you some fudge factor). Do it like you will learn here and once again, you win. Even if they handle the coin. The Challenge: Have your “mark” trace around a dime in the center of a piece of paper and cut it out. Then bet that you can put a nickel through that very hole without making it larger. Get out a nickel and then pocket your winnings. The Challenge: Tear out a match from a book, light it and hold it up (this is the set up. Let them see the match and how fast it burns). Make your bet that you can hold a lit match from this same book of matches upside down directly under your hand for twenty seconds. Hand them the lit match and tell them to hold it upside down with the flame no less than an inch or two away. They will quickly drop it. You take any new match, light it and proceed to hold it upside down for twenty seconds and even 30 seconds is no problem when you know how. You are still a winner, but don’t be too greedy. Save a trick or two for the next time. In fact, just do one or two of these bets at a time at any one place. Keep the mystery going. There are many, many more bar bets in this section. All of them guaranteed winners. Don’t get too greedy. Use the right patter and set this up just right and you can make a few bucks wherever, whenever. You'll learn how to make a real egg bounce like rubber! After they see it and pronounce that it can't possibly be real, you split the egg to reveal the yoke and white! It's a real egg! Learn how to restore a "dead" fly to life! The scene: A fly is captured and "killed." Everyone agrees that it is dead. You do a little mumbo jumbo and the fly is miraculously resurrected and promptly flies away, leaving your friends with their mouths hanging open! How to force a choice on people! You can actually control the choice they make! This can be seriously abused. Please be careful how you use this one! As if all of this isn’t enough, you are also going to get two very special BONUS SECTIONS when you act right now. Learn how to do the best tricks that David Blaine does on television! Levitate a Match - Take a match from someone, place it in your palm and make it levitate, rise right up. Cigarette Through a Quarter - You borrow a quarter from someone and a cigarette from someone else. You then push the cigarette straight through the quarter, right in front of their eyes! How to Float or Levitate Small Objects! The Twisting Arm Illusion! Make your arm twist completely around! Hear the bones crack! 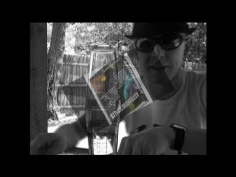 Well over 30 different Street Magic tricks fully explained and illustrated. Another chapter worth more than the price of this book. You can and will completely freak out friends and strangers alike. BONUS # 2 HOW TO USE THE SECRETS OF NLP TO GET WHAT YOU WANT FROM ALMOST ANYONE! NLP stands for Neuro Linguistic Programming. It’s a simple yet incredibly dynamic principle that you can easily learn. It does take practice to become proficient, but OMG is it worth it! You speak a few sentences and suddenly your girlfriend or boyfriend announces that she wants to "be with" you..
A short conversation with your boss and he offers to take you to lunch . . . To discuss your raise. Give your partner a signal that he or she doesn't even recognize and watch as they become amazingly agreeable to your wishes. A different signal and your partner becomes amazingly affectionate. Brain washing? No. Drugs? No. Hypnosis? No. NLP is simply a process that takes advantage of association and belief systems and nothing more exotic than simple, predictable modes of human behavior. Change a persons mood or behavior with just a phrase or touch. Alter their state. Establish and set what are called “anchors” to induce desired behavior and responses. This is a How To of what is called waking hypnosis. How to use your voice to give subliminal commands that will induce behavior and actions that you want. No, it’s not crazy. It’s real. And now it’s available to you. All you have to do is join us now and you can have all of this incredible knowledge within minutes. Even if it’s 2:00 AM and you just can’t wait. That’s what it USED to sell for. For a limited time you can get all of this incredible information right now, for only . . . $2.99 Each! That’s over 40% off the already discounted price of $19.95! Buy them now at Amazon and save! The content of this book is now available as a series of 4 books on Kindle. The series is titled: The Hustlers Bible.” And can now be purchased there for a discounted price. Click here for discounted pricing and info.